This light lunch is perfect for when you don’t want to use your HexB on bread or a wrap for a sandwich. You’ll need a chicken breast sliced as thinly as you can, sliced onion, chopped chilli, garlic and coriander. Lemon juice, salt, pepper, two large lettuce leaves (I used romaine), and a tablespoon of extra light mayo for 1/2 syn (I used Aldi Bramwells). Dry fry the chicken, onion, garlic and chilli until the chicken is browned and cooked through. Throw in most of the coriander, a good squeeze of lemon juice and a good grind of salt and pepper. 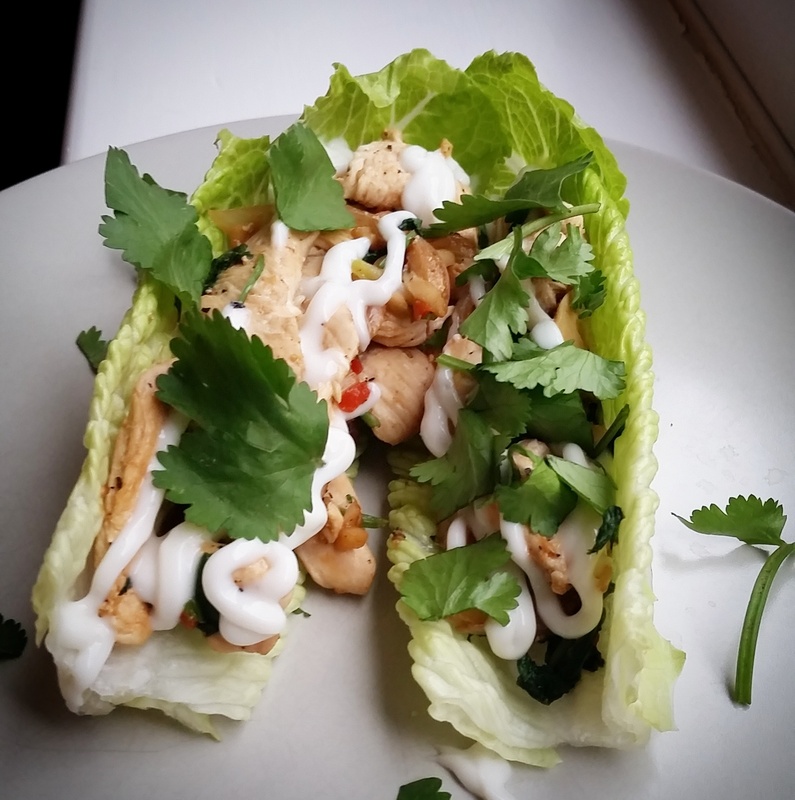 Spoon into the lettuce leaves, drizzle with the mayo and scatter the rest of the coriander leaves over the top. Ready in 5 minutes although I bet I ate them in less! Delicious! I haven’t been sleeping well lately. Well, actually that’s not strictly true…I’ve been struggling to get to sleep then struggling to get up again in the morning, subsequently drinking far too much black coffee to keep me functioning during the day. Anyway, this tiredness coupled with the start of a cold left me hankering for something sweet and stodgy for breakfast this morning. 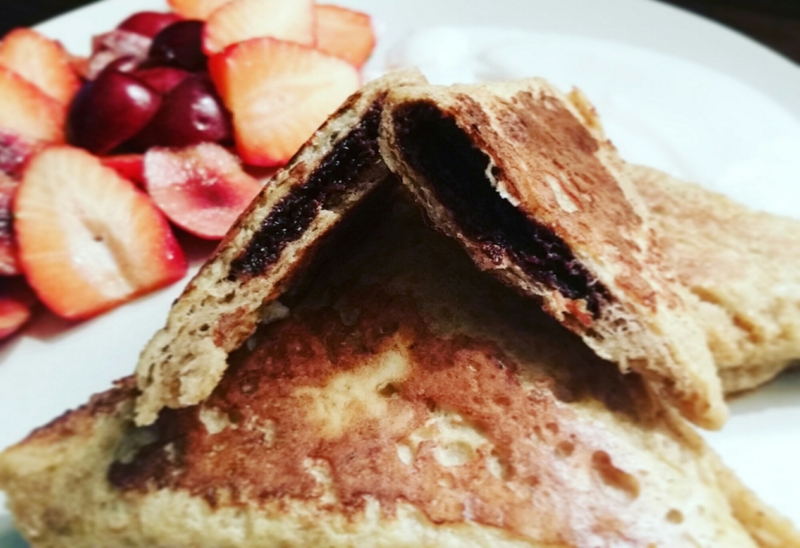 I really fancied proper pancakes with maple syrup and smoked bacon, but actually this is definitely more slimming world friendly. I took three pieces of crustless wholemeal bread (60g) as my Healthy Extra B choice and brushed the edges with an eggy concoction made by beating an egg with a tsp vanilla extra and a tsp stevia. After brushing the edges, I measured out 1 tbsp Choc Shot (2 syns) and divided between the three pieces of bread dolloping it on one half of each slice. Taking a corner of a slice, I folded it over diagonally to make a samosa shape and used the back of a fork to crimp it down to seal. Once all three were folded and crimped I dripped them all in the remaining eggy mixture before dry frying on a medium heat for a few minutes until they were golden. 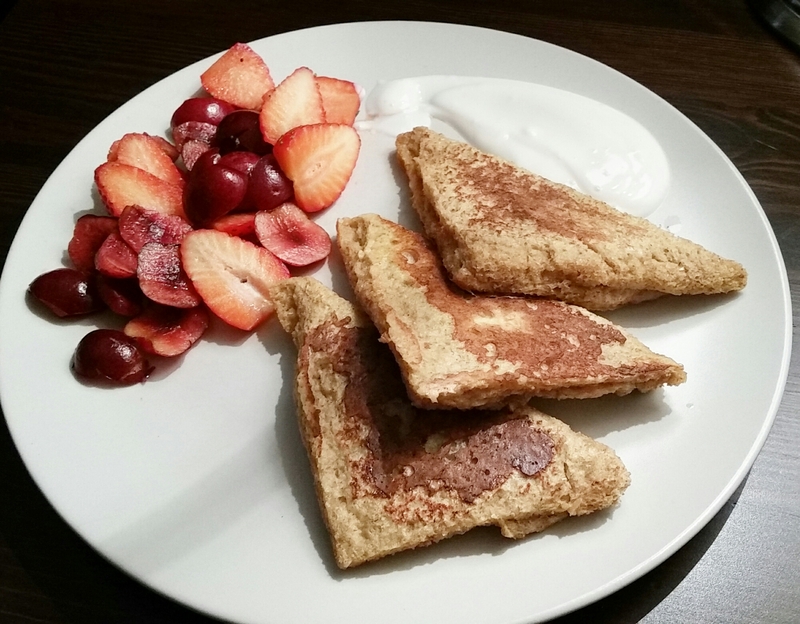 I served these with some fat free yoghurt mixed with a little vanilla extract and fresh cherries and strawberries. It definitely hit the spot whilst staying on plan! Yum! Want to see what else I’ve been eating? Check out my Instagram feed here. If you follow me on Instagram you’ll know that since the beginning of the year I have been following the Slimming World plan in a bid to shift a few pounds before my 35th birthday in June. I have been absolutely amazed at how much you can eat and still lose weight! It really isn’t a diet; I’m certainly not missing out on anything, in fact I’m eating more than I was before and getting better results! At group on Tuesday we had a taster session where members brought in all kinds of delicious food to try and inspire the other members to try new things. 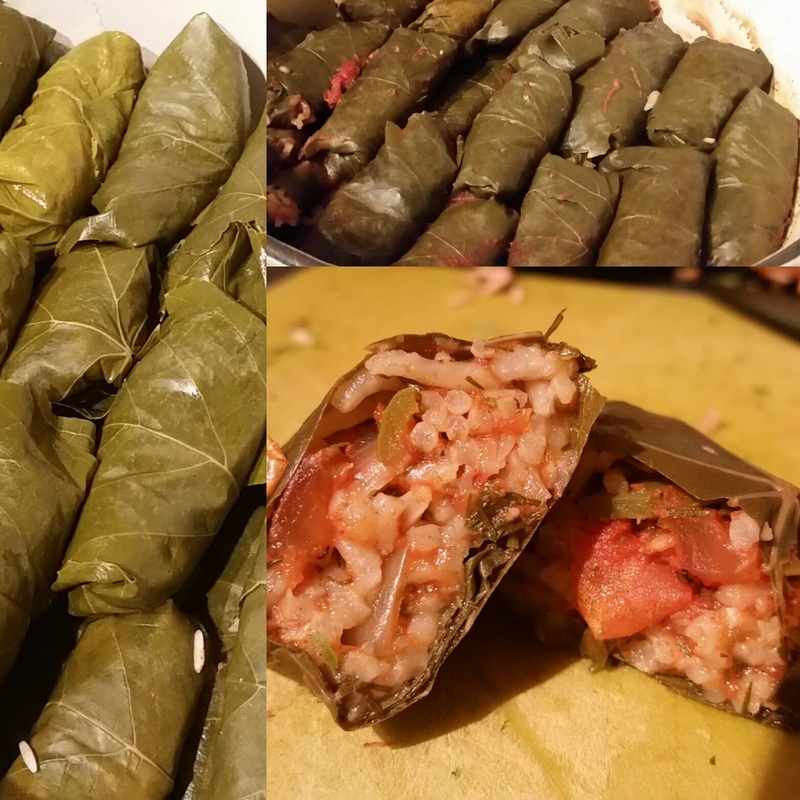 The Assyrian in me has been delighted at how easily adaptable a lot of my native dishes are to the Slimming World plan, so I thought I’d rustle up some Dolma (stuffed vine leaves), with Iynee and Gneve (literally translated as eyes and eyelashes! – I know, I don’t get it either. Basically a spicy tomato salsa and greek yoghurt). They were a hit, with every last one being devoured. They are fiddly to make, but well worth the time investment. Here’s the recipe, passed down from my Granny, to my mum, to me. Enjoy! 1lb minced beef or lamb (less than 5% fat). Alternatively you can make these vegetarian by leaving out the meat and adding in an extra half cup of rice. Soak the preserved vine leaves in boiling water for 5 minutes. Chop the onion, spring onions, tomatoes, celery leaves, green pepper and herbs as finely as possible. Fry the onion and garlic before adding the meat, if using, spices, tomato puree and chopped tomatoes to the pan. and cook through. Allow the mixture to cool before adding in the rest of the ingredients. 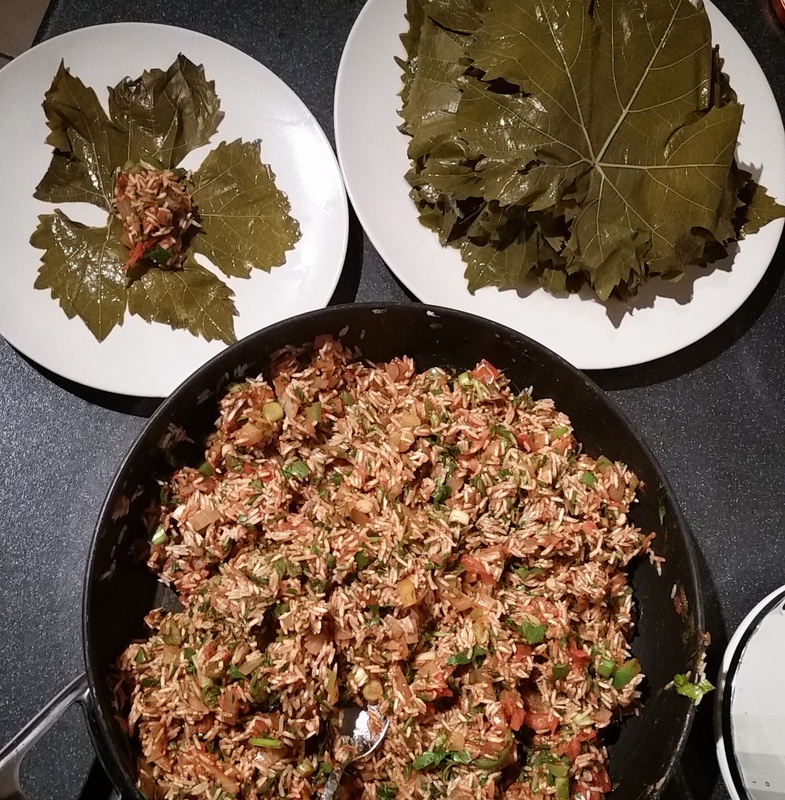 While the mixture is cooling sort through the vines leaves, lining the bottom of a heavy casserole pan with any torn ones (this will prevent the dolma from sticking). When the stuffing is cool, place a dessert spoon of it on the base of a vine leaf, fold the sides in and roll up tightly. Stack the dolmas in the casserole pan as you go. 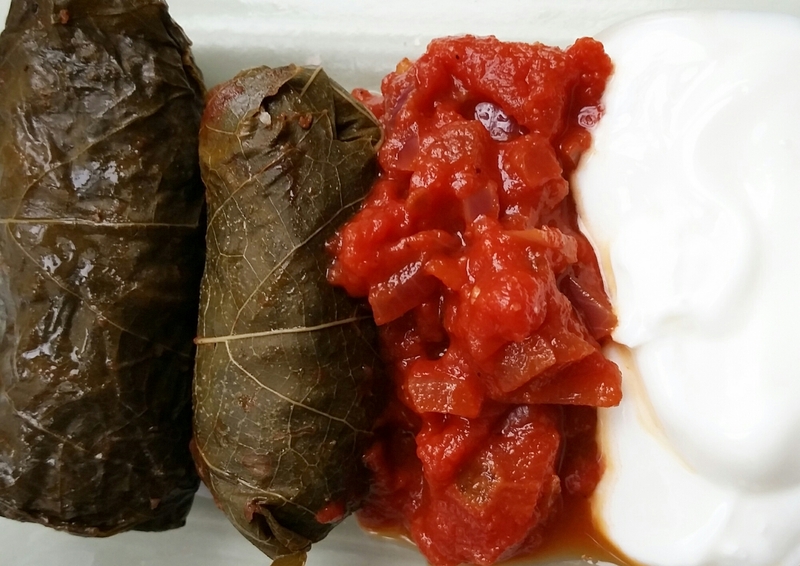 Place a ceramic saucer on top of the dolma once you’ve rolled and staked them all in the pan to prevent them moving around when cooking. Mix together 1.5 cups of boiling water with 1 chicken stock cube, 1 tbsp tomato puree and the juice of half a lemon. Pour over the dolma and boil them for 15 minutes on a medium heat, before turning down to low and cooking slowly for around 45 minutes. Take care not to overcook – soggy rice is grim. Serve with Greek yogurt and make a salsa by frying off 1 onion, 1 crushed clove of garlic, and then adding in 1 tbsp tomato puree, 1 tin chopped tomatoes, 1/2 tsp cayenne pepper, salt and block pepper.